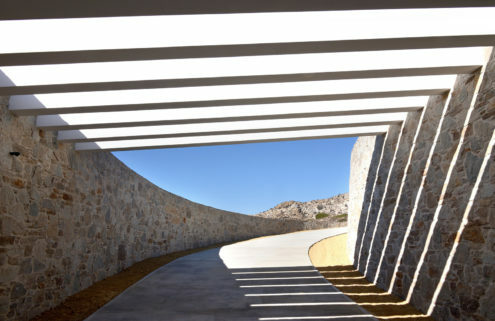 Minimalism meets Baroque – but is it a happy pairing? 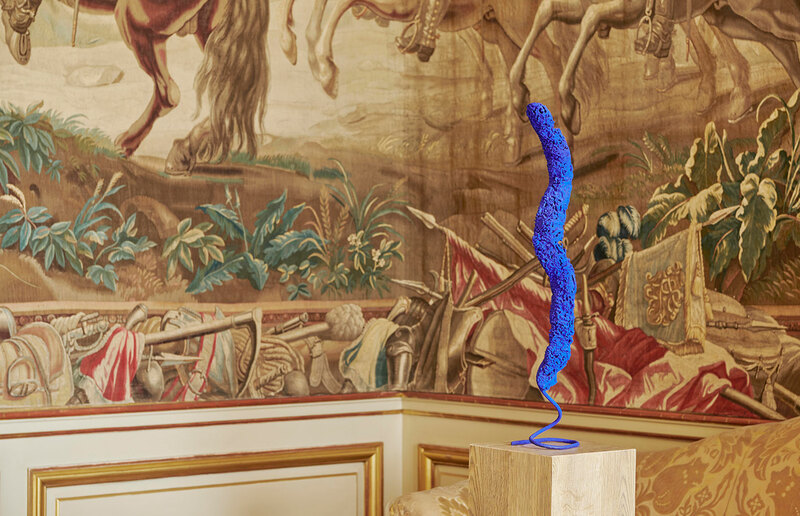 A trail of Yves Klein’s ultramarine sculptures leads you through the Baroque halls of England’s Blenheim palace, their vivid hues bouncing off gilt surfaces and zinging against marble walls. Over 50 of the late artist’s works are hidden within its 18th-century rooms. This radiant treasure hunt is the latest of five contemporary art interventions by the Blenheim Art Foundation. 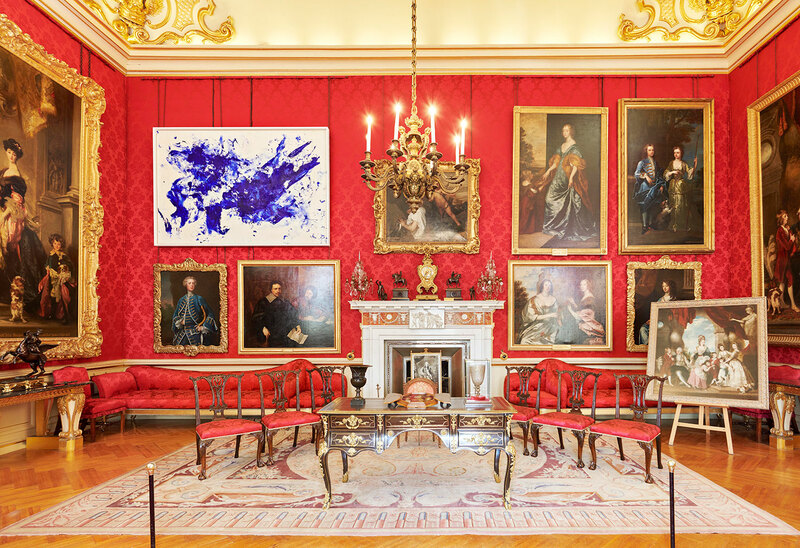 It follows shows by living artists including Ai Weiwei, Jenny Holzer and Michelangelo Pistoletto within the Palace’s astonishingly ornate rooms. Klein’s pool-like ‘Pure Pigment’ in the Great Hall seems to invite you for a dip, while his dazzling Monochrome Paintings lure you down corridors. 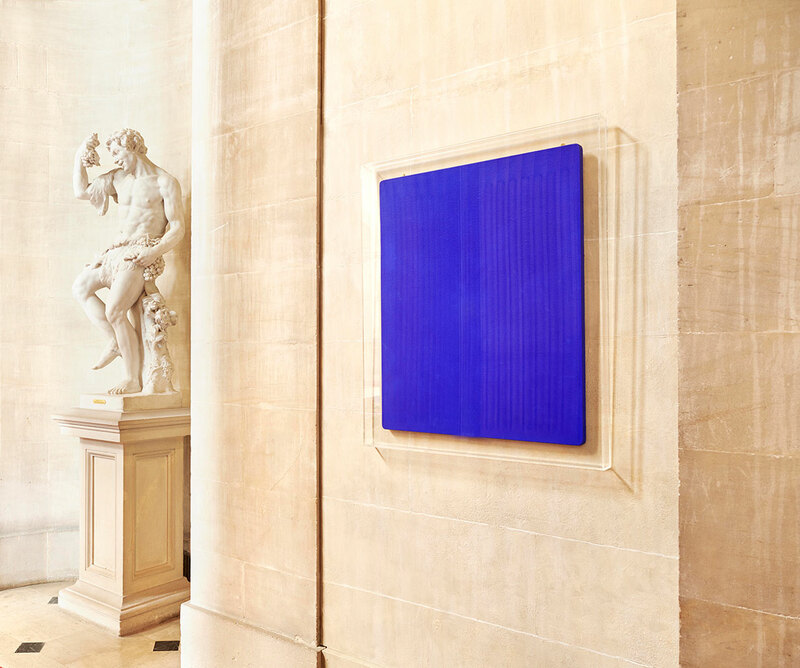 The French artist’s work undoubtedly has a seductive power at Blenheim; his development of his own pigment International Klein Blue (IKB) was about reaching the ‘infinite’ and the ‘sublime’, after all. But does the context add to the works – and vice versa? Frahm points to a 1960 work from Klein’s radical Anthropometry series, for which models covered in paint writhed across a canvas like ‘living brushes’, capturing a moment in time. 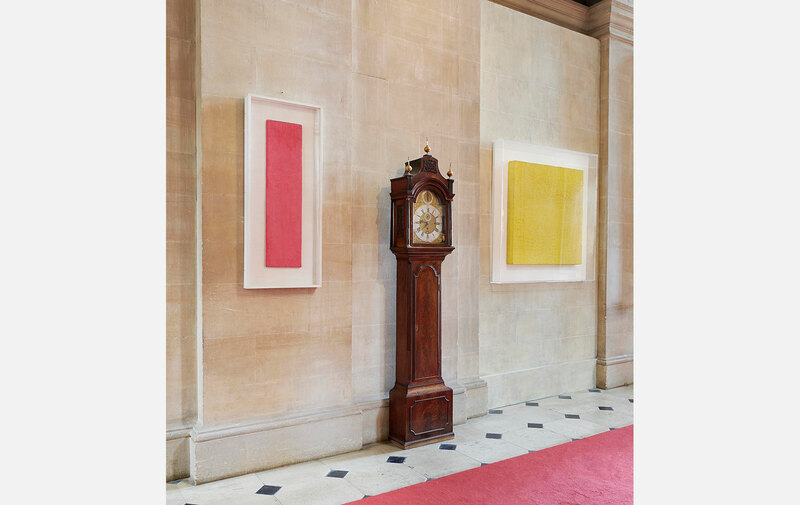 ‘There’s an interesting conversation between the figurative works of Klein’s and the portraits by Joshua Reynolds and van Dyck,’ he adds. But despite its vivid pigment, the painting still clamours for attention in the portrait-laden salon, somehow robbed of life by the blood-red walls. Blenheim’s contemporary art programme is part of a growing movement of UK stately homes coaxing new visitors through their doors with temporary art installations, including Sudeley Castle and Houghton Hall – though the building’s scale puts its exhibitions more on a par with those at France’s Palace of Versailles. But the dialogue can be a tricking one, and sometimes artwork and surroundings compete. 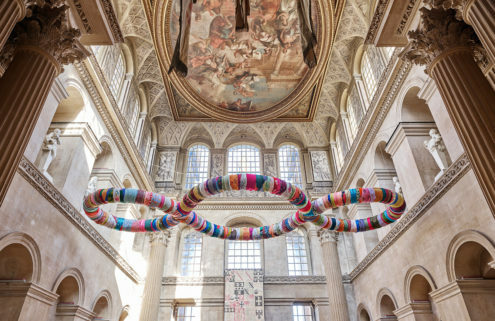 While Michelangelo Pistoletto’s sculptures made from rags and newspapers set up a witty exchange with Blenheim Palace’s lavish furnishings, Klein’s minimalist works and their backdrop sometimes talk over each other. Despite the huge proportions of Blenheim, minimalist it ain’t. Still there’s plenty to thrill in this intervention, from the powdery pigment pool to the startling Relief Portraits peering out from gold panels beside a statue of Princess Anne. 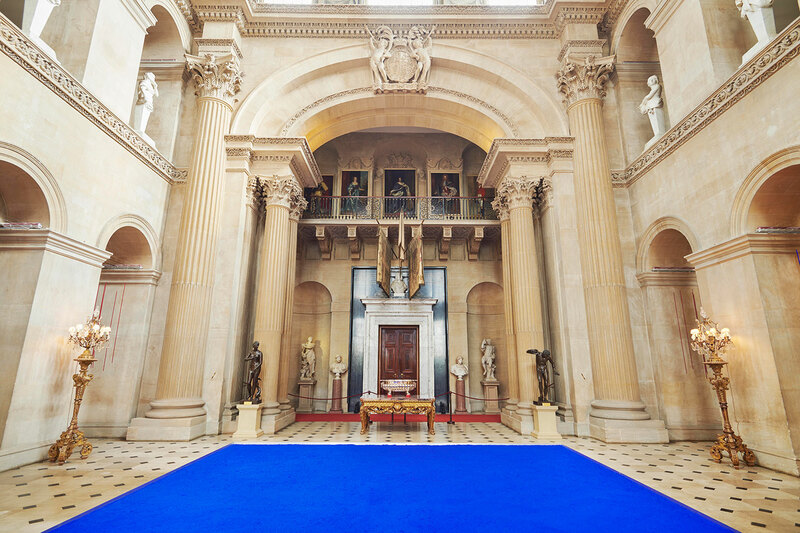 Yves Klein at Blenheim Palace certainly delivers an experience. But you can’t help feeling the works do more for the palace, than the palace does for works. Perhaps we shouldn’t write off the white cube just yet.